Hey there, friends of Paper Sweeties and all my blog land buddies. 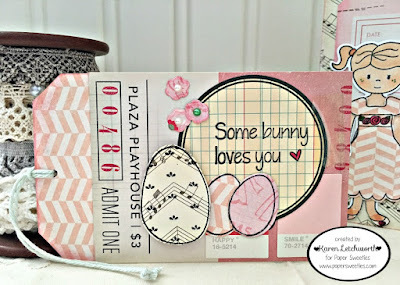 Thanks so much for stopping by again today as I participate in the Paper Sweeties February Blast From The Past Celebration. Today our talented Design Team Members will each be sharing an inspirational project (or two) that incorporates some of their most favorite Paper Sweeties sets. It's a great way to show everyone how well all of Paper Sweeties' products work together to compliment one another, and how easy they are to use together. I can't express to you enough how much will LOVE the darling stamps and dies, embellishments, seam binding, and more from Paper Sweeties. I'm sharing one of my most favorite Paper Sweeties creations I've made thus far. How sweet is Emma in her Easter dress? This card was created using some patterned papers from Crate Paper's sweet Oh Darling line (one of my all-time favorites that I hoard a bit). 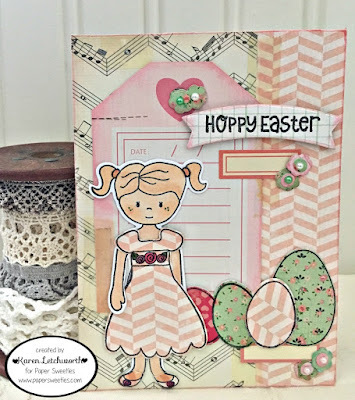 I attached patterned papers with vintage scotch tape, inked the edges, stamped Emma in black, used Emma Sweet Cut to die-cut her, colored her with Copics, stamped her dress and shoes using Jelly Bean Time Stamp Set onto patterned paper, and placed her on a tag. I stamped the large egg from Jelly Bean Time and the left side of the row of eggs from Basket Add-On: Hoppy Easter and placed them together just to the right of Emma. 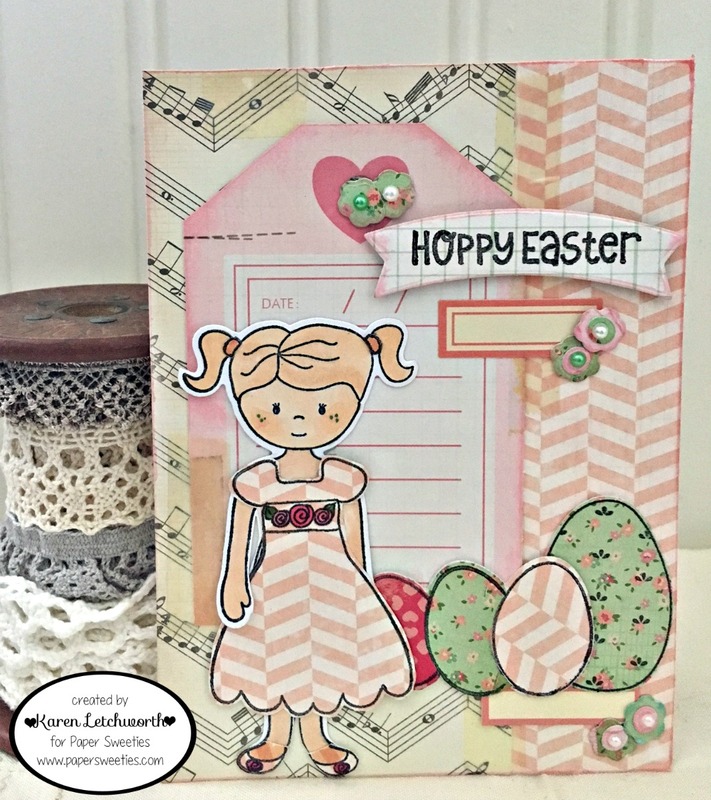 I couldn't resist cutting several of the sweet little flowers and small circle on from the Basket Add-On: Hoppy Easter Sweet Cuts onto patterned papers and placing them here and there as sweet little accents. They adorable, aren't they? Each of Paper Sweeties' stamp sets have cute accent stamps like this. As you can see, I also created a tag to tuck inside this sweet card to be used as a bookmark. 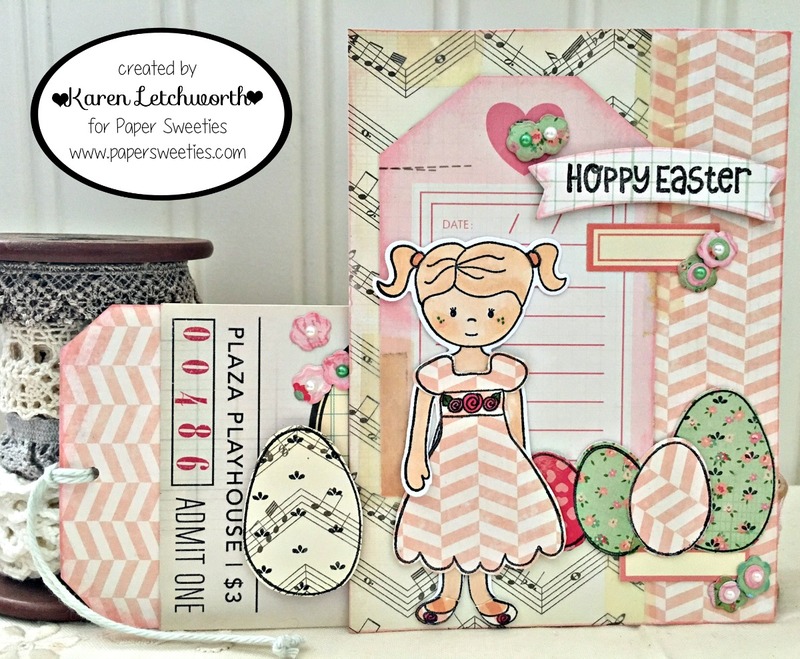 I used more Crate Paper products along with the stamped sentiment (Some Bunny Loves You), small flower, and right side of small eggs from the Basket Add-On: Hoppy Easter Stamp Set and coordinating Basket Add-On: Hoppy Easter Sweet Cuts. Emma looks like Emma's ready for church on Easter morning. Darling, and oh SO sweet!! Here's the list of all my Paper Sweeties DT friends who are sharing some of their favorite "Blasts From The Past" with you all today. I hope you've enjoyed my projects, and really hope you will stop by Paper Sweeties to purchase the Basket Add-On: Hoppy Easter Stamp Set and Sweet Cuts ...or any of the other FABULOUS products they carry. 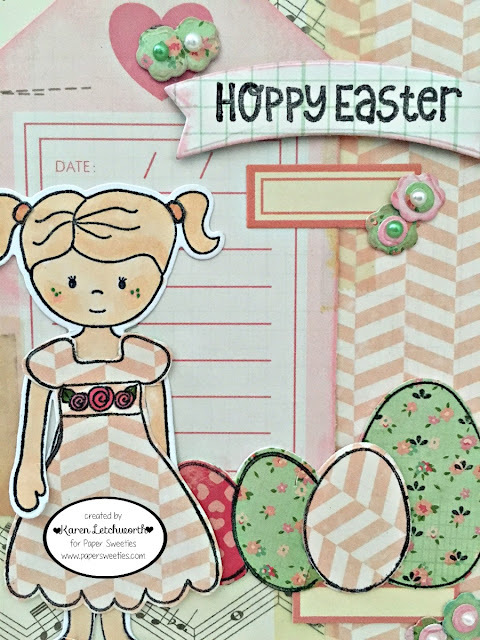 Paper Sweeties can help you create lovely Easter projects, and help you find super sweet products for an entire year of creativity. Happy shopping! Karen, your card is just adorable. Love those eggs. Gorgeous card & tag Karen! It's so sweet and pretty.